Exclusive LR Aether Revolt Preview Cards! This time around we have two uncommons to preview from Aether Revolt. Hear more about our thoughts on these cards in LR 370! Winding Constrictor feels like a name that would have been used by now. Regardless, we have a very powerful gold two-drop here. Assuming you can cast this early in the game, a 2/3 for two mana has proven well above the Vanilla Test in recent sets, and Winding Constrictor is no different. The static ability of adding an additional counter to artifacts, creatures, and you is super interesting as well. For Limited play, the first thing that comes to mind are +1/+1 counters, likely through Fabricate. You’ll get an additional counter, which is a big deal, especially considering that it’s not really costing you much to do so as you get a nice body here anyway. 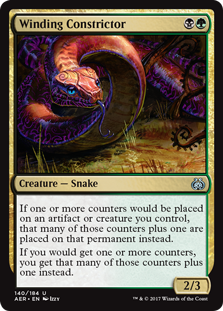 Things get a bit wonky, though, when you realize that it counts all types counters… I’ll let your imagination run on that one (especially you, Commander players) but suffice to say that that you can do some *dumb* things with this guy. Siege Modification is significantly less tricky than Winding Constrictor. It is a much more all in style card that carries significant risk, but also significant reward. 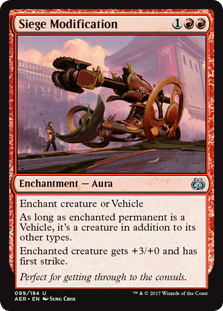 It’s forte seems to be making vehicles into, well, not vehicles, but creatures instead. You don’t have to crew it that turn, or ever again. And adding 3 power and first strike to *any* vehicle we have seen makes it effectively a creature that can’t ever be blocked profitably. Not bad. Now if your opponent has a removal spell, bounce spell, or any other way to neutralize the thread, you just got 2-for-1’d, and we all know what that means. Still, you can’t deny the tempo and power swing this provides. Whether it proves to be worth the risk or not is yet to be seen. The second clause on Winding Constrictor will stack your energy and drink extra poison – are there other counter types that go on the player? Don’t forget that Energy is in the form of energy **counters**. It’s also future proofing in case they ever give players any other kind of counter. It’s time for drive to work? So (BCSM here) I have this and verdurous gearhulk, I play the gearlhulk and give only I the counters it only gets five counters, I choose 4 creatures they each get two counters? 12 power from one gearhulk? Constructed combo? Does winding constrictor work with both options on fabricate?